Suggested planting rate: ten bulbs per 1 ft/sq. Notes: The Allium Neapolitanum spring bulbs produce delicate white umbels with star-shaped flowers that will look beautiful in your garden. 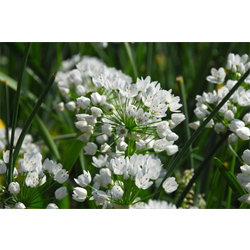 Enjoy the sweet fragrance of these White Garlic blooms.Ornamental cousins of the garden onion. Excellent for naturalizing or pots. Very hardy bulbs will multiply rapidly to form colonies.